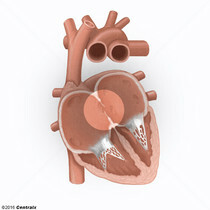 This structure includes the thin muscular atrial septum between the two HEART ATRIA, and the thick muscular ventricular septum between the two HEART VENTRICLES. An opening in the wall between the right and the left upper chambers (HEART ATRIA) of a fetal heart. Oval foramen normally closes soon after birth; when it fails to close the condition is called PATENT OVALE FORAMEN. 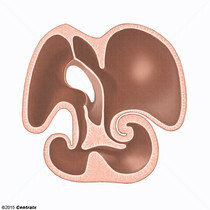 A fetal heart structure that is the bulging areas in the cardiac septum between the HEART ATRIA and the HEART VENTRICLES. 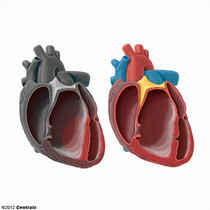 During development, growth and fusion of endocardial cushions at midline forms the two atrioventricular canals, the sites for future TRICUSPID VALVE and BICUSPID VALVE. The thin membrane-like muscular structure separating the right and the left upper chambers (HEART ATRIA) of a heart. 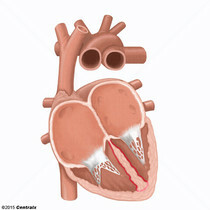 The muscular structure separating the right and the left lower chambers (HEART VENTRICLES) of the heart. The ventricular septum consists of a very small membranous portion just beneath the AORTIC VALVE, and a large thick muscular portion consisting of three sections including the inlet septum, the trabecular septum, and the outlet septum.